Las Virgenes Stakes 2014; Hollendorfer’s Hotties: The (GI) Las Virgenes Stakes is run annually at Santa Anita Park in sunny Arcadia, California at the distance of one mile on the dirt for 3 year-old fillies for a purse of $300,000. The 2014 edition takes place this Saturday, February 1, 2014 and has been used as a prep race to the Triple Tiara of Thoroughbred Racing: the Kentucky Oaks, the Black-Eyed Susan and the Mother Goose Stakes. Last year Beholder won the Las Virgenes Stakes at Santa Anita Park before placing 2nd in the Kentucky Oaks and becoming a two-time Breeders’ Cup Champion. 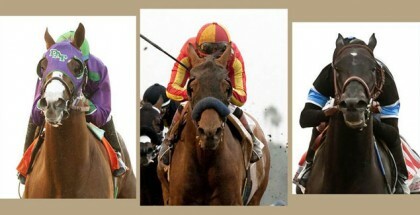 The 2014 edition of the Las Virgenes Stakes takes place Saturday, February 1st. 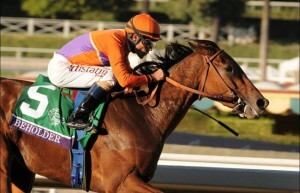 Last year’s Las Virgenes Stakes winner was Beholder for Richard Mandella with a time of 1:36.14. The record is held by Zazu set in 2011 in 1:34.86. The most wins by a jockey are by Corey Nakatani with four and for a trainer the most wins are by the famous D. Wayne Lukas with five. Bob Baffert has won the Las Virgenes three times, most recently in 2012 with Eden’s Moon. The 2014 Las Virgenes Stakes is the 7th race of the day with a start time of 3:30 pm PST on a card of 9 to be followed by the Arcadia Stakes. In addition to the Las Virgenes Stakes, I decided this week to write about a couple of the filly races heading for the Kentucky Oaks since the colts seem to get more publicity on the Kentucky Derby Trail including the Martha Washington Stakes at Oaklawn. This is one tough bunch of sophomore fillies here and I wouldn’t be surprised to see any of them win. Jerry Hollendorfer’s barn has been really hot lately and I seem to do well with a Hollendorfer 1/2 punch to come in the money. So I’m going with that angle in this race. 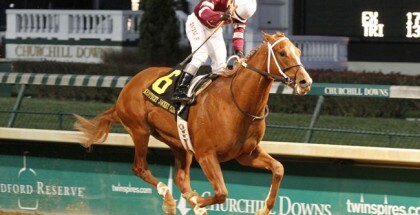 One of my top fillies here is the Jerry Hollendorfer trained Candy Ride/My Success/AP Indy baby Taste Like Candy. I’ve been on the Candy Ride bandwagon for a while and waiting for this one to get a stakes win. She’s had some great workouts recently burning 6f in 1:12.00, 2/14 on January 24th, 5f on January 18th in 59.40, 3/70 and on January breezed 4f in 49.80, 28/57. She broke her maiden at Hollywood Park on October 13th, 2013 going 5 1/2f first time out. Next out she was second in the (GI) Hollywood Starlet Stakes at, you guessed it, Hollywood Park running 1 1/16 miles coming in second to Streaming who she faces again here. Last out Taste Like Candy was second in the (GII) Santa Ynez Stakes at Santa Anita going 6 1/2f on the dirt, coming in second to Awesome Baby on January 4, 2014 where she was put in the one-path running a close second, switched to the outside with a late surge and beaten by a half-length. She has a race record of 3:1:2 and gets her regular rider Bejarano in the irons breaking from post #7. Another nice filly in here from the Hollendorfer barn is Artemis who is sired by Empire Maker/Jelani/Smarty Jones. She most recently broke her maiden at Santa Anita on January 3rd, 2014 going one mile on the dirt where she stalked the pace, drifted out some in the lane to take the lead between horses and held out to win. 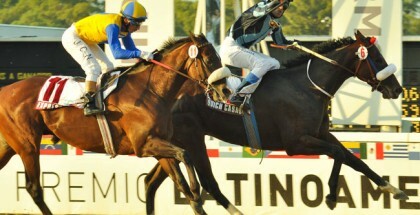 She has a race record of 3:1:1:1 and I expect her to hit the board with Mike Smith in the irons and post #4. Artemis recently has some nice works at Santa Anita on January 28th, she worked 4f in 48.60, 8/25 and on January 23rd, 6f in 1:15.00, 9/11. Streaming is the one to beat here. The daughter of Smart Strike/Teeming/Storm Cat and trained by Bob Baffert won an impressive firt-out maiden going 6f at Betfair Hollywood Park on November 15, 2013 where she won by 1 1/2 lengths. This will be her first start since she upset the Starlet Stakes going 1 1/16 miles at Hollywood where she pressed the pace before getting the lead from Taste Like Candy in the stretch and drew clear for the win. This will be her first try switching from synthetic to dirt but she has done her training at Santa Anita over the main track with six drills since the Starlet. Her most recent work was 5f in :59.80, 8/78 on January 26th, prior on January 20th, she worked 6f in 1:11.60, 1/11. Streaming gets Martin Garcia again in the irons and breaks from the outside post #8 with five extra pounds on board. An impressive 6 1/2 length gate to wire maiden win on December 29th, 2013 under a stretch hand ride for the Simon Callaghan trained Fashion Plate, makes it look as though this girl could contribute to a lively early pace when stretching out for the first time this weekend. The daughter of Old Fashioned/Miss Puzzle (Aus)/Citidancer (IRE) will be making her fourth start in this race. Fashion Plate exits gate# 2 with Gary Stephens riding. He has been up for her most recent works including 5f on January 25th going 59.80, 7/48 and prior on January 18th, 5f in 1.01.60 35/70. She also has some nice works at 4f and has the highest speed rating of the group. There are so many good fillies lined up this year for the road to the Kentucky Oaks and this weekend could show us a few top ones. I like the Taste Like Candy and Artemis to hit the board for Hollendorfer in the 2014 Las Virgenes Stakes. Like Streaming, Taste Like Candy will be two-turning for the second time in her career and these two could well be head to head again in the early stages. Fashion Plate looks like she’ll set some nice fractions up-front so well see how she does stretching out here as well as Aretemis who has some great speed and being the daughter of a Belmont winner doesn’t hurt either. All four of these girls will be right up there in the mix. If the pace gets too hot and bombs-away, then possibly Sushi Empire or Arethusa could come in and sweep-up. So my top four picks for the 2014 Las Virgenes Stakes are #2,4,7,8 with #4 or #7 nailing the win. If I play this race, I’ll play against the favorite, which I think will be Streaming and use all four in one leg of a pick 3 and also play a $2 exacta with 4,7/2,3,4,6,7,8 depending on the tote board. 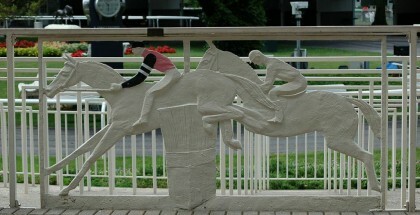 Good luck to all of the fillies Saturday and safe run!